Total beginner here. I know absolutely nothing about anything, but I want to build stuff. Preferably for cheap. Books, kits, anything? Seen by many as the "bible", and probably required reading at some point is "The Art of Electronics". Quite old now (everyone is waiting for a new edition) but the detailed treatment of basic analog electronics (transistors/opamps/filters/regulators/etc) is still just as important. More good books recommended here. 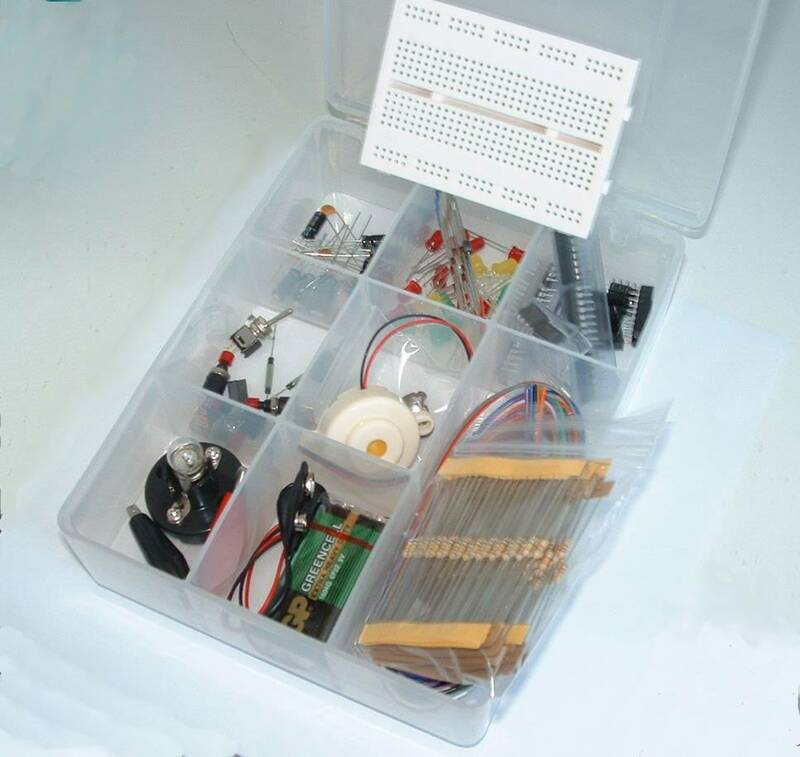 Buy/assemble a basic electronics kit to experiment with. There are plenty of circuits in the above mentioned books you will want to try out. This should include a breadboard, some batteries/small power supply, soldering iron/solder, common values of resistors/capacitors/inductors/potentiometers/crystals, common transistors, common opamps, LEDs, 555 timer, a few different logic gates and maybe a few sensors (LDR, electret microphone, pressure sensor, temp sensor) and a DC motor and/or stepper motor. Well, the obvious answer is to immerse your self in things electrical and electronic - anything that you find interesting - microcontrollers, firmware, motors, relays, power lines, radios, cables, the list goes on and on. Read - Read and Read more. The Internet is FULL of good information. Once you get your feet, arms, and head wet in this stuff then dive into getting an education in the field. If you love the stuff you'll never regret the opportunity to continuously learn and play with new things. Your education could take many forms based upon what you think you want to achieve. But do consider that in the formal sense to be an electrical engineer probably involves an organized education program at a university or college that exposes you to important fields such as advanced mathematics, electonics theory, economics, electrical energy concepts, physics, technical writing, chemistry, public speaking, computer programming, logic design plus others that may apply to various types of specialization. There are many electrical engineers in the world that made their way through self learning, practical investigation, expirmentation, reading books, going to a trade type course, learning through a mentor and outright determined self motivation. Many of these folks are valuable contributors to society and the places where they work. As such they are to be admired and respected. All that said though there still exists a bias toward those educated in a formal organized program. Well, as others said, the solution is to immerse yourself in books, experiments and problems. We could be here all day talking about sites, books and other stuff for you to learn, but the point in electronics is to be self-taught most of the time. I would recommend to start with Arduino. Why? Because it's cheap, easy to understand and build simple stuff. Well, big universities are providing free classes for anyone with a computer. EdX is a partnership of MIT + Harvard. So, you can expect something amazing already. Also, you will have free access to a book about Circuits and Electronics for beginners. The course name is 6002x. So now, it's up to you! Also, a bit of motivation is good! You need the basic knowledge of mathematics.This is known as engineering mathematics. You can't do anything without mathamatics. So your asking a book, this is the book that I could recommend. Then you need the basic knowledge of bellow subjects. ^ above is more than 2 years [4 semester] subjects. If you need to be success you need these bunch of additional knowledge too. No matter how hard you tried, it will require at least 3 years to complete these things. I don't know how you will manage to keep you in track without exams. I found exams keeping me in track and right pressure. So I suggest you to join somekind of open university if you can't afford your full time for this. Decide on your first project - something you want for yourself, but not too ambitious, so you would succeed. Like a blinky bike light, small headphone amplifier, led collar for a dog, etc. You have to WANT it - this will make it easier for you to be motivated when you fail and reward you when you succeed. Search the internet on how to build it, pick one design that seems to be the simplest, consult people about it. 2.1. Bonus points if you take some stuff apart to find parts that you need - taking things apart is a good way to look at real life electronic designs. At first you will not understand anything, but in the long run it will sink in. Ask people, what to take apart to get parts that you need. Oh, and your soldering skills will become better. Soldering iron and desoldering pump is a must. 2.1.1. Not necesarilly all the parts in the design have to be exactly the same, ie if someone has specified a particular transistor in the design does not mean it's required here, maybe they just had this one in their junk bin. Certainly, it might be some specs are critical, but for many simple projects there is a big chance it's not. It might happen that any random small transistor from TV is ok. I've seen a lot of people who abandoned their projects just because they could not get a particular specific model of transistor for their guitar effect. Those can be substituted, their performance might not be optimal, but hey, all you want is to hear some buzz! Understand it! Understand the function of every component in the design. Change the values of components, find the limitations. Fail fail fail fail fail You will fail and it's normal, don't get depressed about that. The question "how to get started?" is a bit different from "what should an EE know? ", but perhaps the endpoint will inform the beginning point. These program criteria apply to engineering programs that include electrical, electronic, computer, or similar modifiers in their titles. Curriculum The structure of the curriculum must provide both breadth and depth across the range of engineering topics implied by the title of the program. The curriculum for programs containing the modifier “electrical” in the title must include advanced mathematics, such as differential equations, linear algebra, complex variables, and discrete mathematics. According to ABET, if your program does not do this, your program will not be accreditable. This is what the IEEE and other orgs think that every degree granting electrical engineering program should include. It's interesting to note the part about "systems containing hardware and software". It's perfectly appropriate, but probably wasn't there 20 years ago. I wonder when it was added. In any case, I think there are two distinct steps that often occur in parallel. Learn how to use that toolset to solve problems. Learn how to extend your toolset, and recognize when you need to do so. Step 2 is the big one. Guidance, like the kind you find in engineering programs, can help, but frankly some people never get there. As a corollary, learning the tools is not what makes one an engineer. Much of the advice you've been offered here mostly seems to go along the lines of "pick a problem", "learn the tools you need to solve it", and "solve it". A great way to start. Another important aspect might be to form an interest group into a team, and collectively solve a problem. As for right now, I'm not sure which tools you pick are terribly important in your path so long as they provide you with abilities "necessary to analyze and design complex electrical and electronic devices, software, and systems containing hardware and software components." 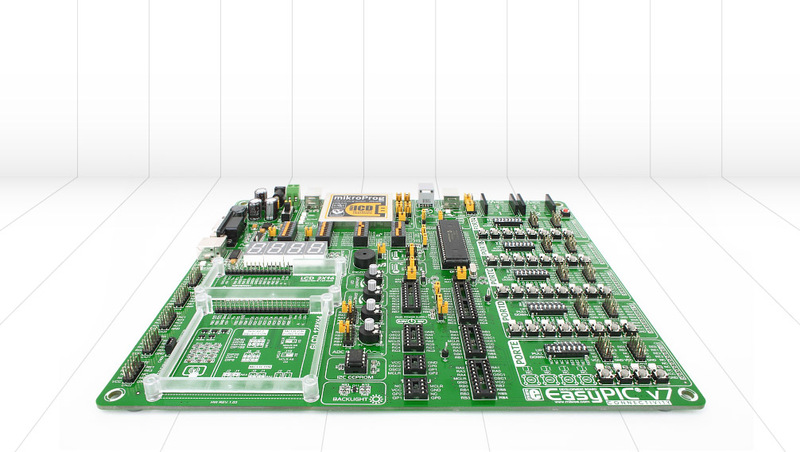 How to get started with electronics and specifically cheap microcontrollers? How do I get started with electronics/hardware? Good book for PIC 18F beginner? Anyka AK1120Q - 'Mobile Application Processor', Spy Cam, cheap cam-corder?